Oct. 1 marks the opening day of the striped bass season on the Santee Cooper system and coastal rivers. The bag limit of three fish per day with a minimum size of 26 inches remains in effect through the May 30, 2017, closure. The seasonal closure and the harvest restrictions have worked to increase the abundance of striped bass and the survival of fish to older ages in the Santee Cooper system. As the season opens, anglers are encouraged to practice the best catch-and-release methods to minimize stress. 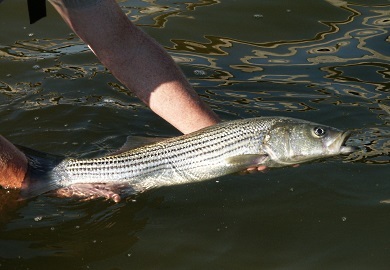 The seasonal closure was started in 2008 to reduce the stress-related mortality of striped bass during the warm summer months. Length limits alone cannot protect striped bass during the warm season because catch-and-release stress results in a high rate of mortality, even when handling is minimized. As the season opens, anglers are encouraged to practice the best catch-and-release methods to minimize stress, particularly when water temperatures remain above 70 degrees. This includes the use of single-hook lures, barbless hooks or hooks with mashed down barbs, and de-hooking tools. Fish should be handled with wet hands and returned to the water as quickly and gently as possible. The best handling techniques allow the fish to remain in the water while the hook is removed. Also, phones and cameras should remain powered up so that pictures can be taken quickly. Anglers are reminded that no hybrid striped bass have been stocked in the Santee Cooper systems. Striped bass with broken lines are commonly found in lakes Marion and Moultrie, but they are not hybrid stripers. The 2014 year class of Santee Cooper Striped bass is exceptionally abundant. Even though spillway gates at Wilson Dam remained open for more than two months last fall and winter, and a significant number of fish moved downstream, the S.C. Department of Natural Resources’ (SCDNR) winter sample captured more two-year-old fish than ever before. Most striped bass anglers have closely adhered to the initial regulations and are acknowledging the positive effects of that sacrifice. The 26-inch minimum size limit has increased the number of fish reaching minimum spawning size and age.